After an intense overtime game against Sussex Central, Indian River High School has held onto its winning streak. 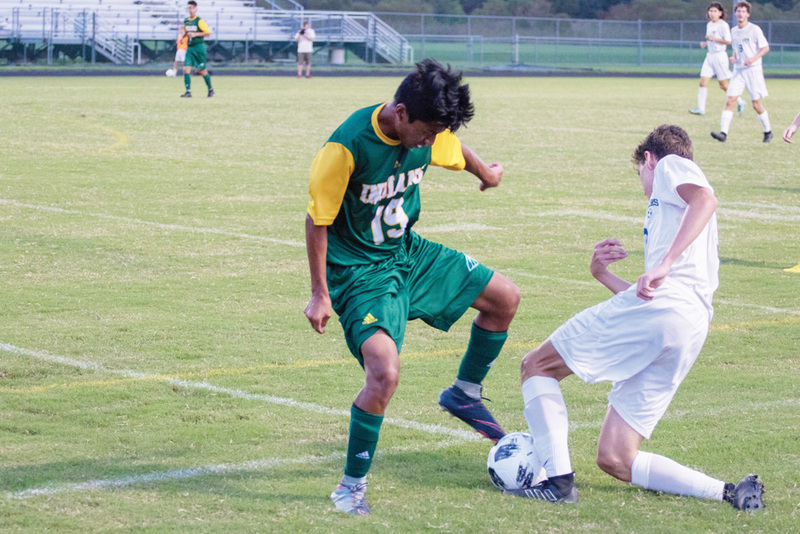 In the end, it was a penalty-kick goal — in overtime — from Jared Cordoba that proved to be the game-winner for IR as they defeated Central 3-2 to remain unbeaten through their first six games of the season. It wasn’t looking good for IR just over two minutes into the game, when Central’s Johnny Garcia snuck a shot past Indians’ goalie Zach Neal to put the Golden Knights up 1-0. Opportunity after opportunity, shot after shot — Central goalie Watson Dorsinvil kept the Indians out of the goal and off of the scoreboard, including a spectacular save on a penalty kick shot from IR’s Juan Linares. Central went into the halftime intermission clinging to the 1-0 lead. It remained that way until, with just about 18 minutes left in the game, Yves Graf took a breakaway pass from Luke McCabe and chipped his shot past Dorsinvil to tie the game at 1-1. The crowd went crazy, and it seemed to burst the tension balloon floating along the IR sideline. Continuous pressure from the Indians over the next 15 minutes finally paid dividends when Graf again got into the clear following a pass from Cordoba, and slipped a shot into the lower right corner of the goal, just inside the pipes, to give IR the 2-1 lead. “I was very happy” to score the goals, said Graf, who is a junior German exchange student at IR. “At first I didn’t want to play, because I was hurt, but then it was really close, and I wanted to play, and I wanted to score the goals. And as the time wound down, it looked good for IR to win it in regulation. However, Central’s Garcia had another idea. After IR was whistled for a foul with just 10 seconds remaining, Garcia took the free kick from just about 20 yards out, drilling it just under the crossbar to tie the game and send it into overtime. IR continued its offensive pressure on the Central goal, and Linares was again taken down inside the box to draw another penalty-kick opportunity. This time, it was Cordoba taking the shot, and he sealed the deal to deliver the win. IR was credited with 24 shots in the contest, with Dorsinvil making 13 saves for Central. Neal made two saves to pick up the win for the Indians, who also held an 11-3 advantage in penalty corners in the contest. In their game last Thursday, Sept. 27, Indian River had posted a 7-0 win over Lake Forest in a South Division contest. Cordoba scored a pair of goals in that win, with five other Indians also figuring into the offensive barrage as Tony Velasquez, Alex DiLuzio, Yonafer de Leon, Omar Baker and Willem Lambertson each scored a goal. Neal made six saves for IR, and Bastian Perry made seven, splitting time in the goal. The Indians were set to be back in action on Thursday, Oct. 4, (after Coastal Point press time) with a road contest against Seaford. Results from that game can be found on the Coastal Point sports Facebook page.